The beautiful island of Dinagat is still unfamiliar territory to most tourists. This secluded paradise has some of the most stunning sites in the country, and is often compared to Palawan of 20 years ago. You can’t even imagine how virgin it is, and it’s only a matter of time before it gets discovered. Our Dinagat tour packages include airfare and boat transfers, accommodation and guided tours. This is your chance to visit this special place without needing to worry about anything. Enjoy an encounter with the wild nature of the Philippines – breathtaking, mysterious and romantic. Dinagat is perfect for adventurers and nature lovers, who are willing to endure the hard trip there. Visiting these islands will reward you with a very unique experience, but because reaching them is complicated it’s very important to plan well in advance and use expert advice. The main thing to do in Dinagat is to enjoy its natural beauty. We strongly recommend staying for 2-3 nights so you can calmly explore everything this area has to offer. Overnight tour packages are also available, and include the island hopping tour which is by far the best attraction in Dinagat. We’ll help you choose the activities and tours that fit your taste the most. Our experts will make sure you get to see all the beautiful places, and enjoy the best activities. Add any item you like to your wish list, or contact us now, and we will help you build the perfect itinerary. Dinagat is fairly close to Siargao so we recommend combining these 2 beautiful islands into your vacation package. However, there’s no direct ferry between the two, so you will need to spend at least one night in Dinagat. Our 3N4D package will let you explore both islands and enjoy one of the most amazing places in the Philippines. Read below for more details about everything Dinagat has to offer. If you book any tour through us, it will save you the hassle of arranging a boat and you will be accompanied by a licensed tour guide. Dinagat is an amazing island but also extremely underdeveloped, so it’s much better to book a tour package and avoid any potential problems. The most convenient place to stay on Dinagat Islands is San Jose, the provincial capital. It has the most comfortable hotels and resorts, and its proximity to most of the island’s attractions make it ideal. Affordable accommodation is in the town proper, while there are also several private beach resorts that are more expensive, but also much nicer and more romantic. You can find really good rates here. in Palawan, for example, you would pay double for the same hotel level. Choose your preferred resort from our list, or contact us instead. We will be glad to help you find your dream resort, for only a fraction of the price compared to other destinations in the Philippines. Flights : The closest airport is in Surigao City in Surigao del Norte. There are several early flights from Cebu, or from Manila with a layover in Cebu. Ferry : The ferry service from Surigao Port starts at 05:30 AM and the last trip is at 02:00 PM. The ride is between 1 and 2 hours, depending on the weather. Bus : It’s possible to Take a bus from Butuan City or Cagayan de Oro. Getting around : The most means of transportation are either tricycle, habal habal (motorcycle ride), or a private van. Best time to visit : March to October are the drier months of Dinagat Islands and make the better time to visit. 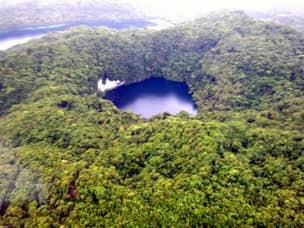 Attractions : Nature, island hopping, lake Bababu, caving. Local festivals and holidays : “Bogkusan sa Isla” celebrates the union of the municipalities of Dinagat and their new status as an independent province in 2011. It takes place at the beginning of December. What to do in Dinagat Island? Tropical beaches, secluded islands and lakes will leave any visitor in awe. When Alex Garland wrote his novel “the beach”, he lived in a place very much like this. If you happened to read the book or watch the movie, than you will understand the atmosphere of these islands, a secluded wild paradise, waiting to be explored. Dinagat is difficult to explore without a guide, as it is to the most part still undeveloped and heavily forested. Choose your points of interest from the list below, and we will build a personalized itinerary out of your wish list. There are so many islands around for you to explore, that you’ll need a very long time to visit all. The most popular islands are in Basilisa Municipality, just a little north of San Jose. Lalaking Bukid Island for instance is famous for its mesmerizing beaches – Bitaog and Kakakongan (and many others, which aren’t as popular). Other prominent islands around are Isla Aga and Sondayo, where you will find secluded white beaches shielded by limestone cliffs and coconut trees. Another noteworthy spot is Oasis Islet, in front of Libjo Barangay. There you will see many islands and islets scattered in the water around, creating some truly spectacular views. There are so many hidden spots and majestic beaches, so if that’s yours thing Dinagat is perfect for you. Each town has its own unique attractions and sites. In Basilisa you will find the famous lake Bababu – lake which connects to the ocean through an underwater tunnel. The tunnel is 650m long – the longest underwater cave in the country. The lake itself is surrounded with tall cliffs from all sides, making its surface very calm. It creates a unique phenomenon – a layer of 8m of fresh rain water that doesn’t mix with the sea water underneath. San Jose is a the capital of the province. If you choose to spend your nights there, make sure to visit the white castle of Dinagat – owned by the Ecleo Clan, a very influential family in this province. You could also pay a short visit to the PBMA shrine (a local religious organization founded by one of the Ecleos), since the shrine has a very beautiful and well maintained garden. In Libjo is a beautiful beach town, where you can stop and gaze at the small islands in front of it, and even explore them by boat. Take a guided tour in the enormous Quano Cave, and be amazed of the limestone formations inside. There are plenty of other sites to visit, such as the bonsai forest in Loreto Town, the bat sanctuary in Tubajon, or countless other hidden gems of nature. There are plenty of private beaches in all parts of the main island, especially in Cagdiano. Because of the great number of things to do and see, we recommend to take some time in Dinagat, appreciating it to the fullest. How does Dinagat fit into your travel plan? If you are looking to add a destination to your schedule that is wild and mysterious, Dinagat is just for you. It’s a great choice for nature lovers, couples on their romantic holidays, and anybody who wish to visit one of the world’s last frontiers. But keep in mind that it’s very rustic. So, if you standards are really high, it’s best if you check out El Nido in Palawan, or Caramoan Islands. Thanks to Dinagat’s proximity to Siargao Island, it’s very advisable to pair these two destinations together. We recommend you spend at least a couple of nights in each, so a short trip to this area isn’t advisable. Hradship trip and the most nervous part of it are the waves awaits as wee go along…..
Amazing place for a nature tripping! Highly recommended. I am interested on your Dinagat and Siargao package. May I know the itinerary. Does it include island hopping? Yes island hopping is included. Please fill out our inquiry form and one of our agents will get back to you with a quote. How much would it cost per day of your dinagat tour without the inclusion of airfare? Do you have a minimum pax? 3days 2 nights tour. We don’t have a minimum amount of people. Price depends on where you are coming from and what are your travel dates. I assume you also need accommodation? The best thing would be if you just contact us through our inquiry form and fill in all the relevant details.